Going to the oceans, lakes or rivers has to be the most relaxing and calming experience one can ever have. 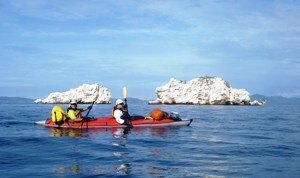 However, majority not only love the serenity of the waters, but also enjoy water activities, for instance, kayak. In our Advanced Elements kayak review, we are going to introduce to you one of the most convenient and inflatable kayak, the Advanced Elements AE1007-R. Here is a quick recap on what we think of this kayak. Easy to fold, store and transport. Advanced Elements has one goal that they work towards to make their customers’ outdoors experience the best possible one. They make convertible kayaks to bring ease to your adventures and travels while providing ultimate fun alongside. Their motto is to combine the design of inflatable kayaks with the latest and greatest of technology. 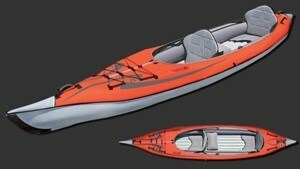 Advanced Elements makes different kinds of kayaks. For instance, they make AdvancedFrame Inflatable kayaks, StraightEdge kayaks and canoes, and Lagoon Inflatable kayaks. They provide a lot of accessories as well while kayaking, and they are all in moderately expensive. For example, paddles, dry bags, hand pumps, wind paddle, first aids and drinking systems for when you are on the water. Read along to find out why kayakers love this model and think it is the best convertible inflatable kayak in the market. 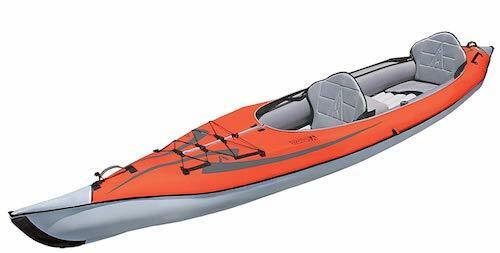 This kayak of Advance Elements is a convertible and inflatable sit-inside kayak. It is around 15 feet long. It can be rowed solo or with a friend or partner, which we call it tandem. Indeed, when talking about convertible and inflatable, the first thing that comes to our mind is that this kayak is easy for transport, and it doesn't take up much of your storage space as well. It is easy to deflate as well, by far we are certain that it doesn't require skillful personnel to inflate or deflate it. It is probably one of the best that you can find in the market because of its amazing features and specs. From the look of it, it seems like a comfortable and easy to use product that you will love on your trips. Not to mention that it is light weight and spacious at the same time, making it easier and fun to use out on the lake or river. Let’s talk about a few specs of this inflatable wonder. The length of this kayak is 15 feet, which a comfortable length for even an above average tall person. This kayak is 32 inch in width, which means it would be easier to get into and ensure a comfortable ride down the water as well. This boat weighs only 52 lbs. This quality of this product makes it easier for you to transport and carry it from one place to the other. The maximum weight capacity is 550 lbs. This feature makes it strong enough to carry a heavy person as well. As it is an inflatable kayak, Advanced Frame kayak has inflation valves through which you can blow air when you want to go on the water and take it out when you want to store or transport it. The kayak has rubber handles attached to the bow and stern for carrying. It has built-in aluminum ribs that ensure the kayak’s stability on water and give it a firm shape when inflated. The bow has ropes attached to it in a way that makes an open compartment so you can keep your gear in the reach of your hand while on the water. The convertible kayak is made of a reliable rip-stop nylon material, which ensures your safety on the lake or river. On water, certain amount of pressure builds up, for this purpose this kayak has pressure release valves on the surface of the floor chambers. The kayak might look vulnerable to sharp objects due to its inflating feature but it is made of 3 layers of sturdy material that ensure complete protection from punctures. It has a tracking fin that ensures the boat maintains balance on the strong water waves. It comes partially assembled from the factory so you have a bit of an idea on how to assemble or disassemble it after your use. You unfold it, put some air through the valves to inflate it and followerd by attaching the seats. Durable - The three layers of material used in the construction of this kayak make it extremely durable because it would take something extreme to damage it. Comfortable - The seats are padded and have a high support back, which will make it comfortable for you to paddle a long time on the water. Versatile - It can be used individually or by pairs as well. It has 3 seating compartments so you can enjoy the waves in solitude or with your friend or partner. Sturdy body - Due to the aluminum frame, the Advanced Elements’ Advanced Frame is very strong and will give you the sense of security on the water. Carrying compartments - You can carry your gear with you wherever you go because of the laced deck of this kayak. Shrinking in size - As it deflates and inflates, it will be very easy for you to store it or carry it. You will not have to worry about where to store your convertible kayak, you can just fold it up and out it anywhere, even in a tiny shelf. Multiple colors - It is available in 2 colors, red and green. So, you will have an option to choose your best preference from these two very cool colors. As it comes with an inflatable feature, you would have to get some accessories with it, for example a hand pump to fill it with air when you want to use it. 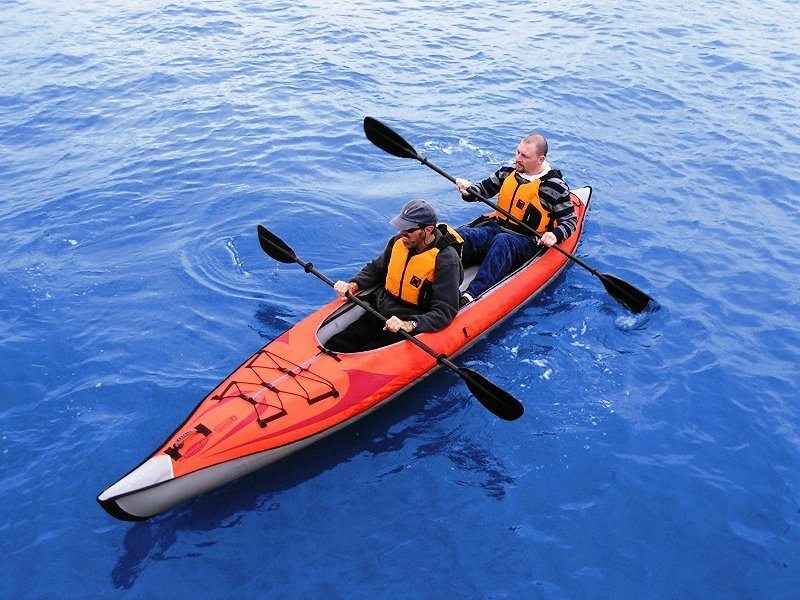 It would take a little bit more time to go to the water than when you use a normal boring kayak because of the little amount of inflating time of this kayak. It does not come with paddles, you will have to get them separately. Editor's Note:- The Advanced Element is our personal favourite due to its portability and conveniency. Just take it out from the carrying duffle bag, inflate it and you are good to go. Advanced Elements kayak reviews are satisfactory enough for you to make a good decision. The customers are truly happy and content with this convertible kayak from Advanced Elements. 95% of the people said that it was a great kayak, and termed it a good investment. Some said it is pet friendly and very durable. It has been said that this kayak also seems to be beyond expectations and is very comfortable to use. Only a few customers had a little bit of trouble with the kayak and were not happy with the product. 5% of the people gave this convertible kayak bad reviews. They complained about the kayak being too tight to sit in or said the kayak was deflating on its own while being used. Some said that the kayak was not even, which allowed water to get inside it more than usual kayaks. If you are interested to know some other brands of kayaks, feel free to read our reviews. We have also done a review on the Best Inflatable Kayaks. If you wish to see more tandem options, check out our article on the Best 2 Person Kayak reviews. It would be very useful to have this kayak if you are a water lover. Going in lakes, rivers or the sea would become much easier and fun with this convertible kayak. On top of that, it has a good number of satisfied customers and reviews. We would definitely rate this product a 4.5-stars. Lastly, we hope you have enjoyed reading our Advanced Elements kayak review. Wait no longer and go try out this beautiful kayak on the gorgeous waters of this planet Earth. I am Douglas Keister, an ordinary man who loves nature and adventure sports like kayaking, camping and water sports etc. I have been into all these activities for almost 10 years now and have learned a lot from it. With my experience, I will be providing the most reliable and accurate information to my readers.